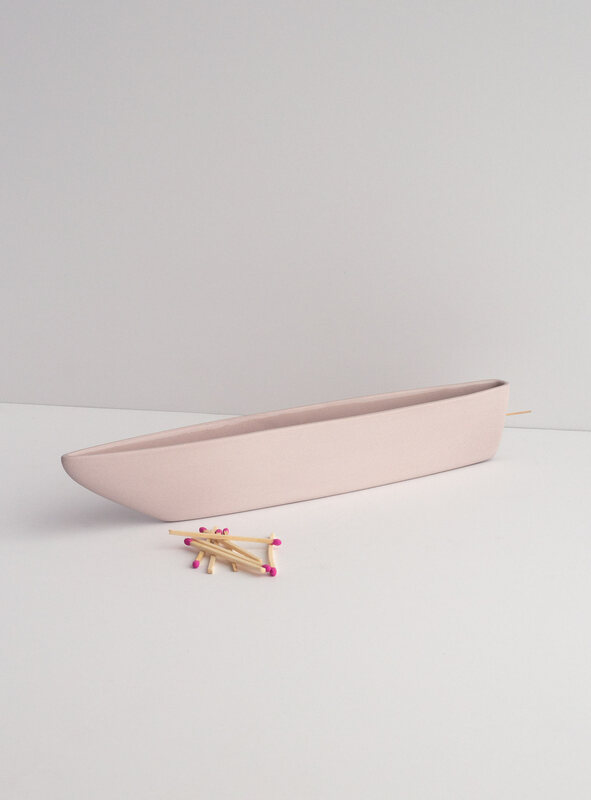 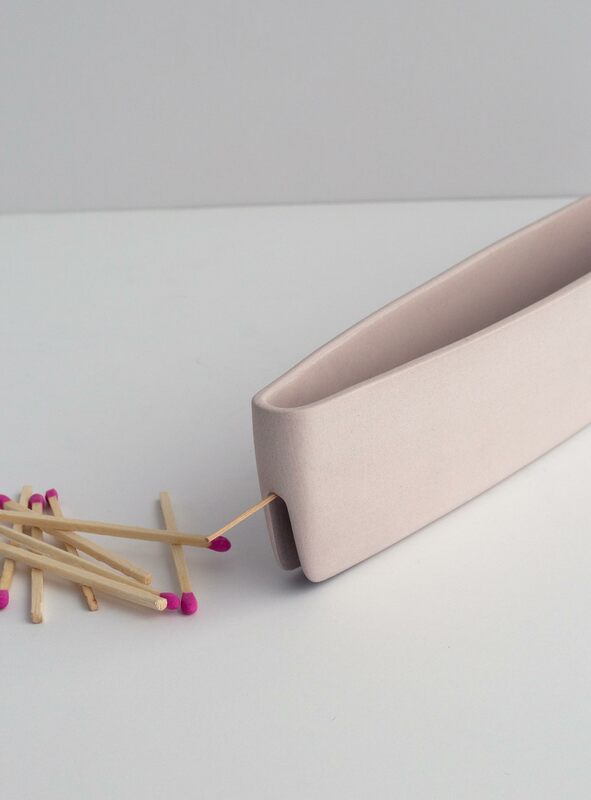 Drift Incense Holder—a soft, elongated form that echoes the lightness of rising smoke. 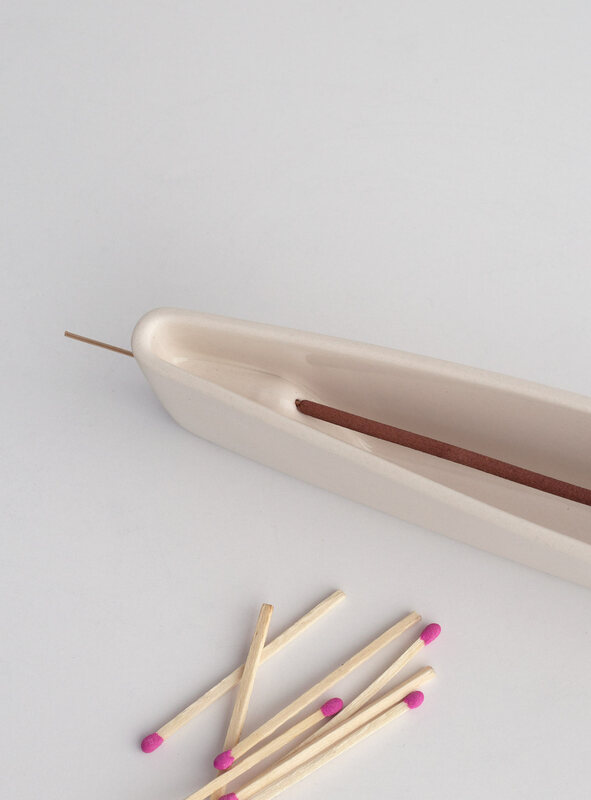 An incense stick is held within a single piece of hand-cast porcelain that catches and contains the ash within a glazed interior. 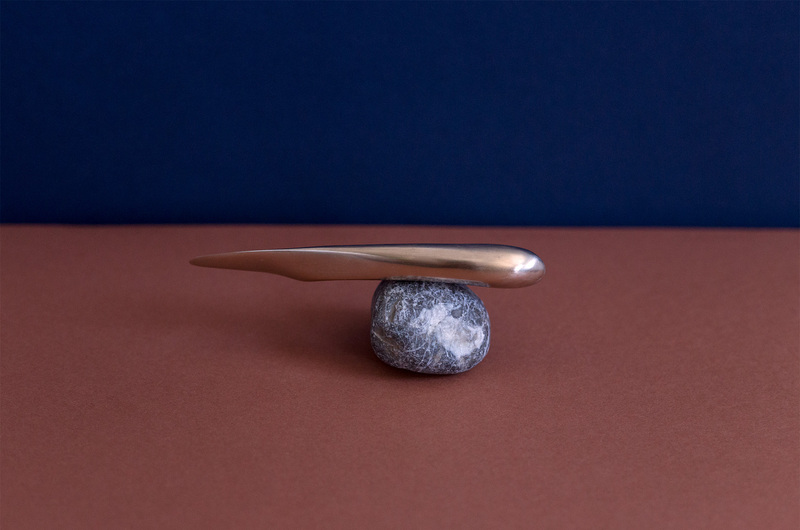 Inspired by geologic fact and design possibility, the PEBBLE & the STONE is an edition of bronze stem blocks that mirror the earth's material history. 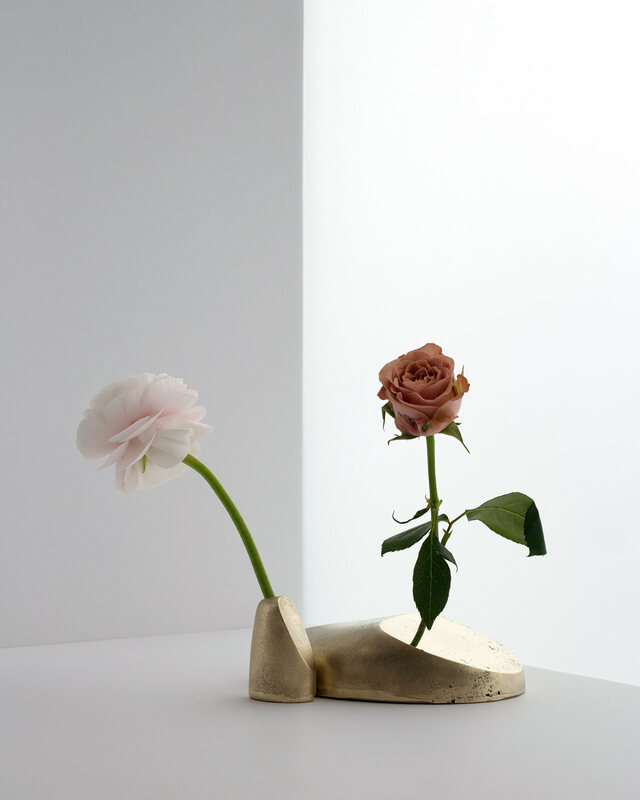 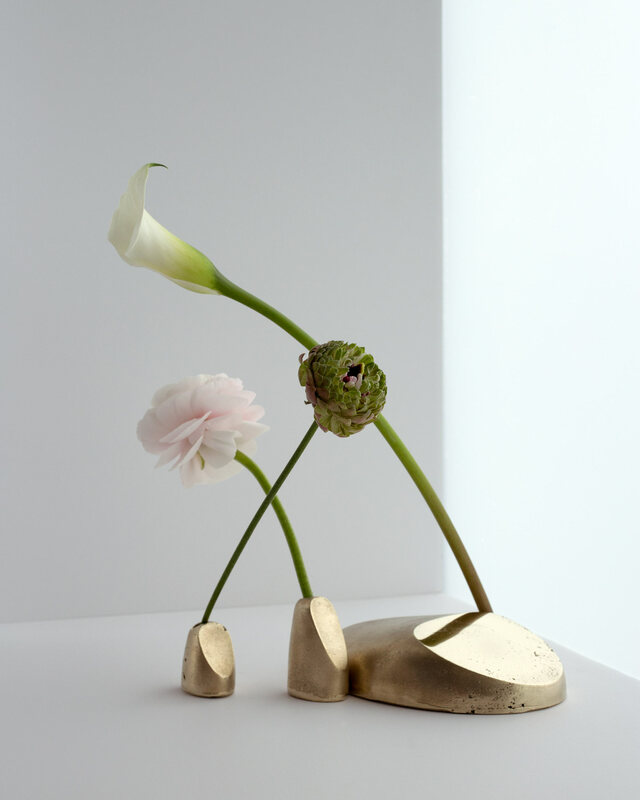 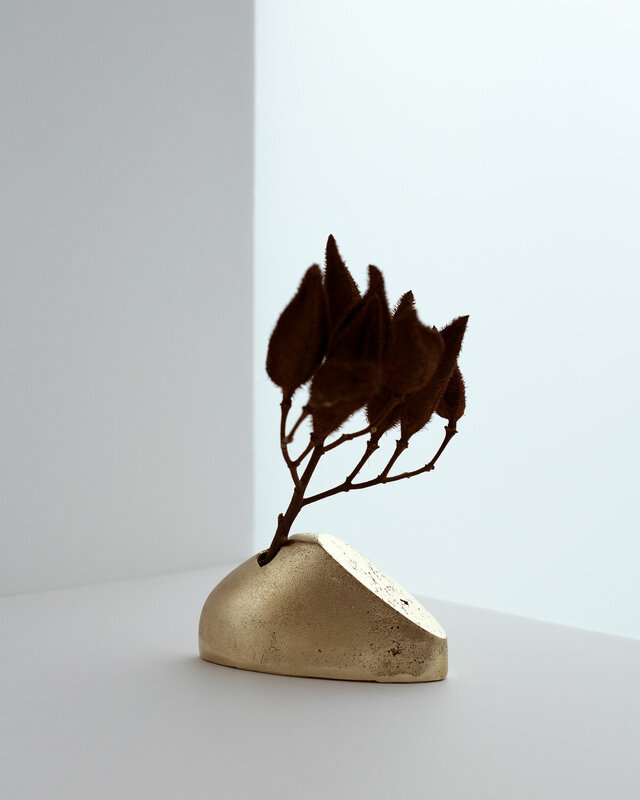 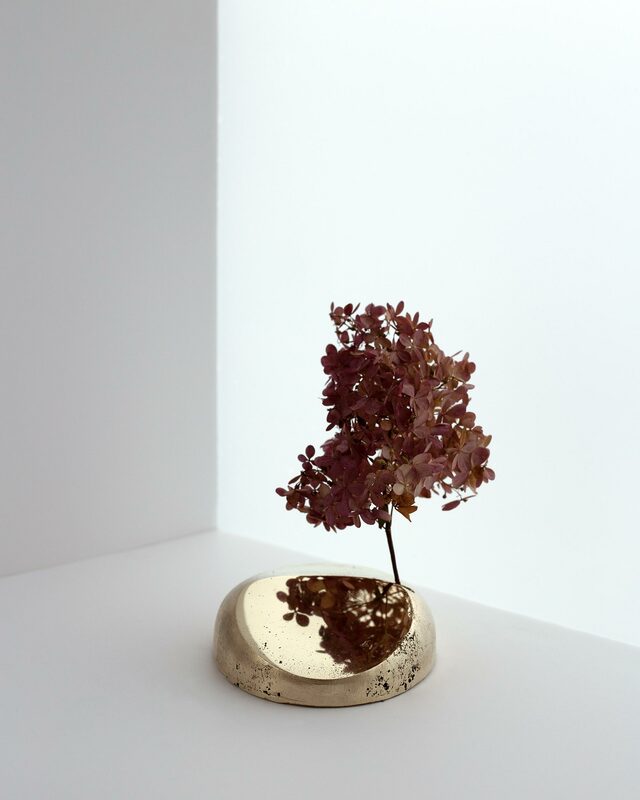 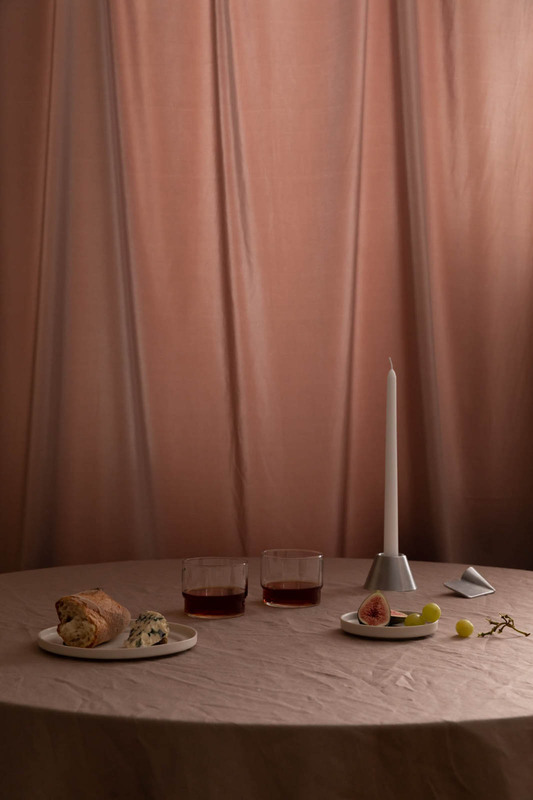 Available exclusively at Flùr, these substantial objects are raw, sand-cast bronze. 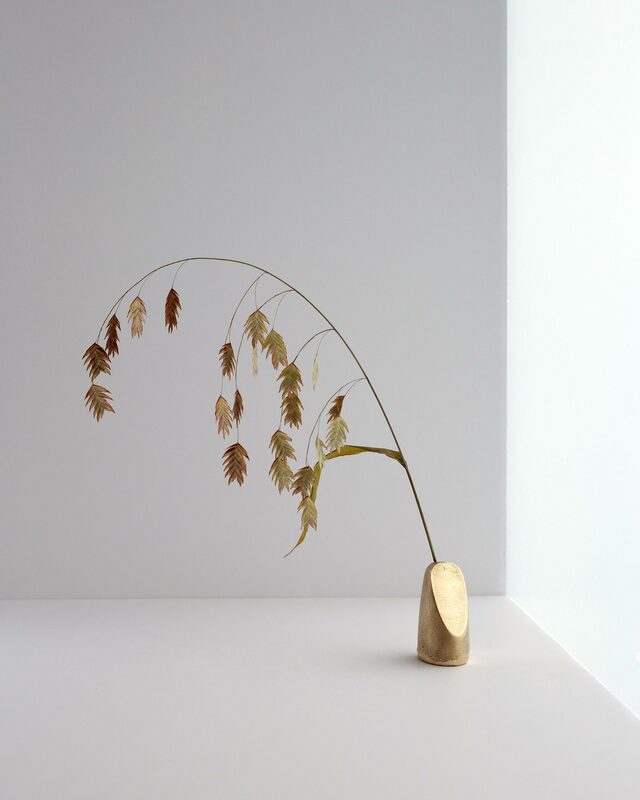 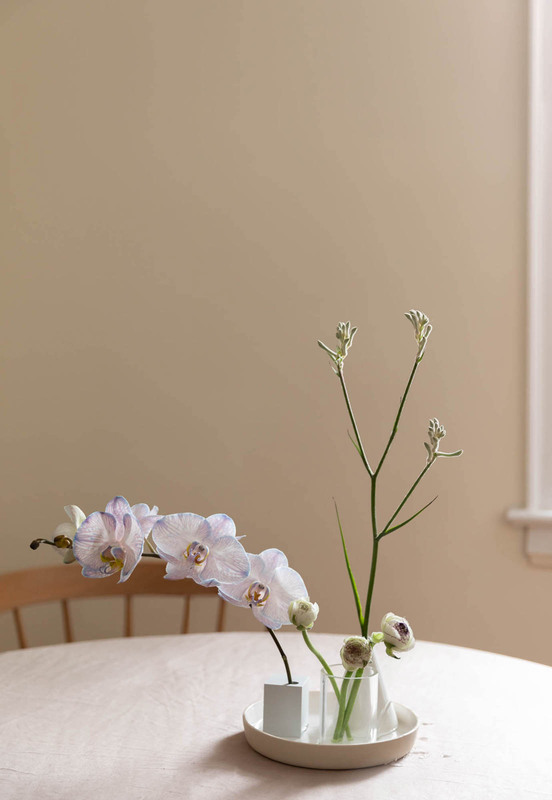 Five sublime forms beautifully anchor dried stems, blooms, and long-lasting greenery in a waterless state. 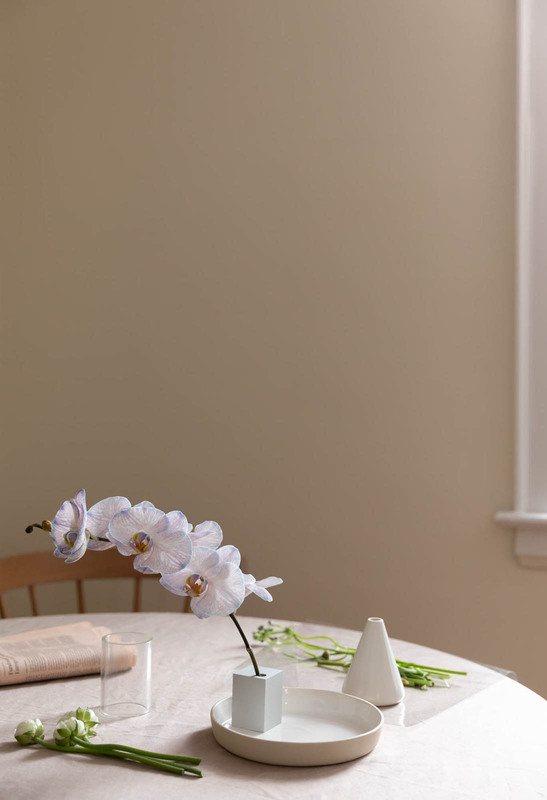 Display them individually or in groups, on shleves, mantles, or as centrepieces. 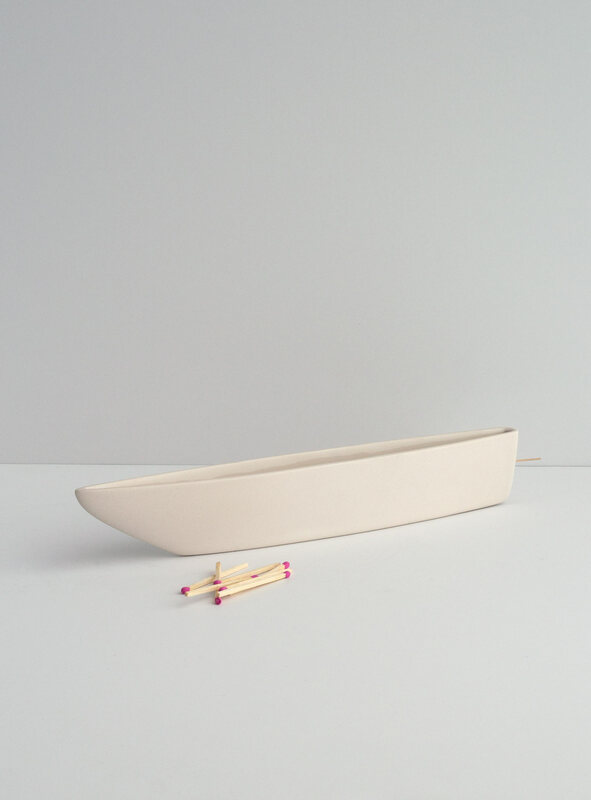 Composite Vessels are a multi-functional display system. 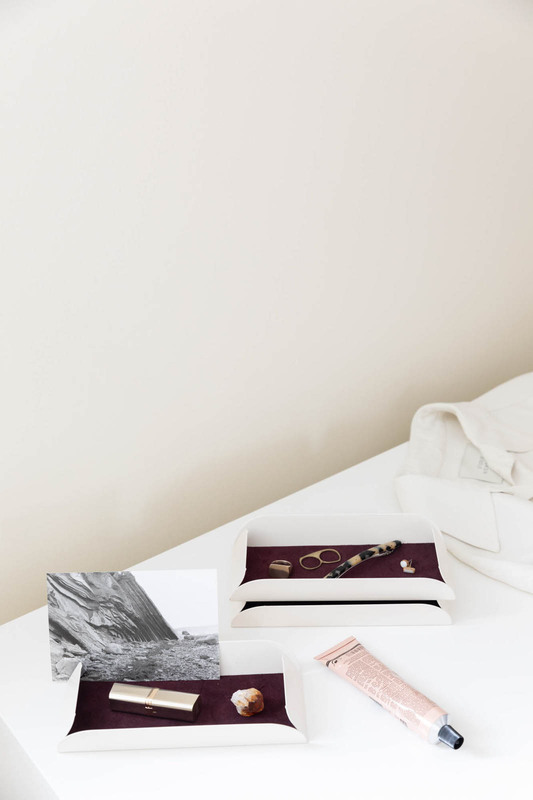 A porcelain cone, sturdy glass cylinder, aluminum block, and stoneware tray simplify clutter and showcase life’s paraphernalia. 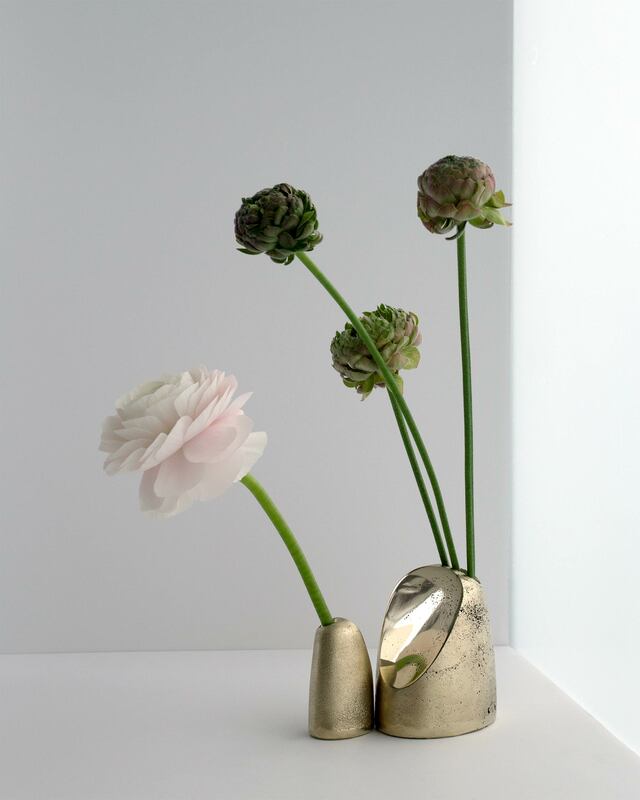 An ideal container for flowers, greenery, or a perfectly sharp pencil. 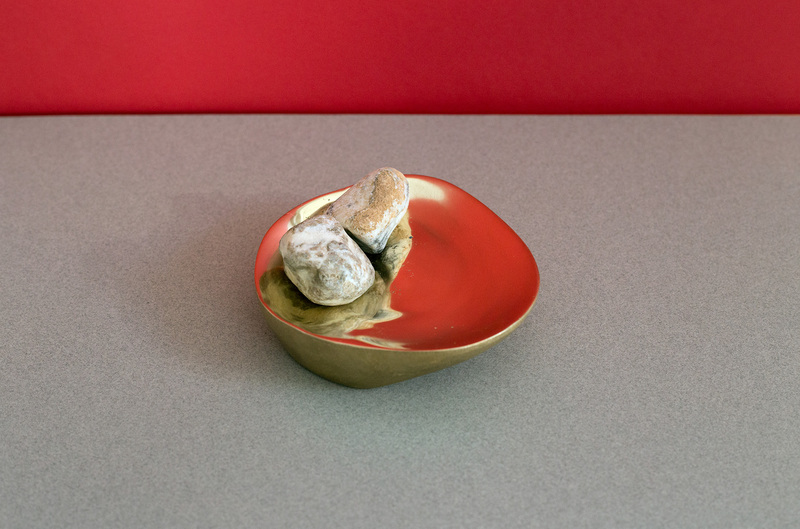 Available individually or as a set. 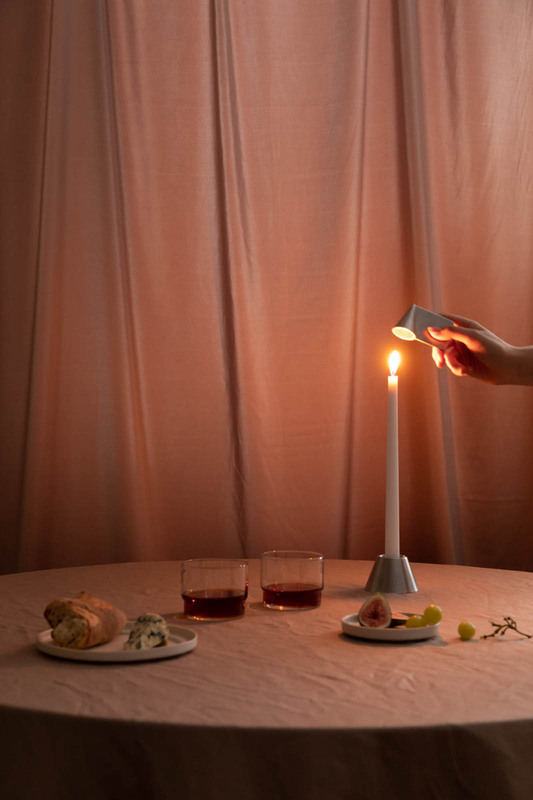 Art direction by Alley Kurgan. 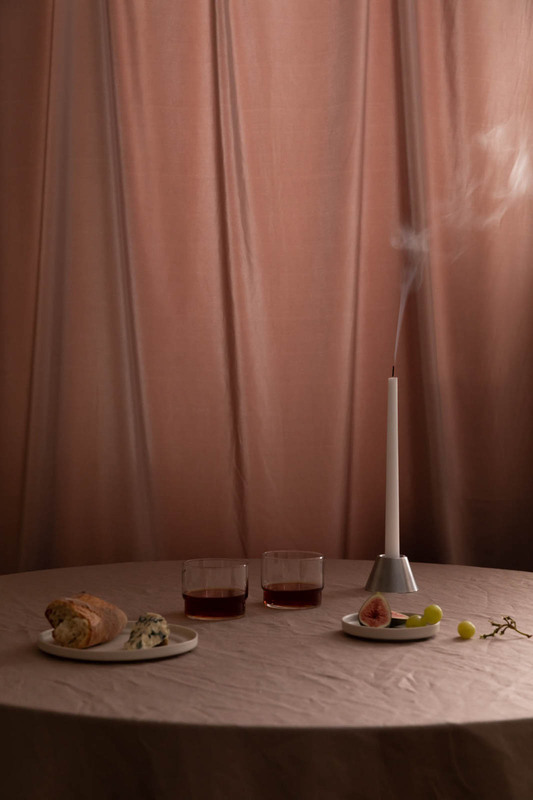 Twin Candle Set brings two forms together—one to support a lit candle and the other to extinguish it. 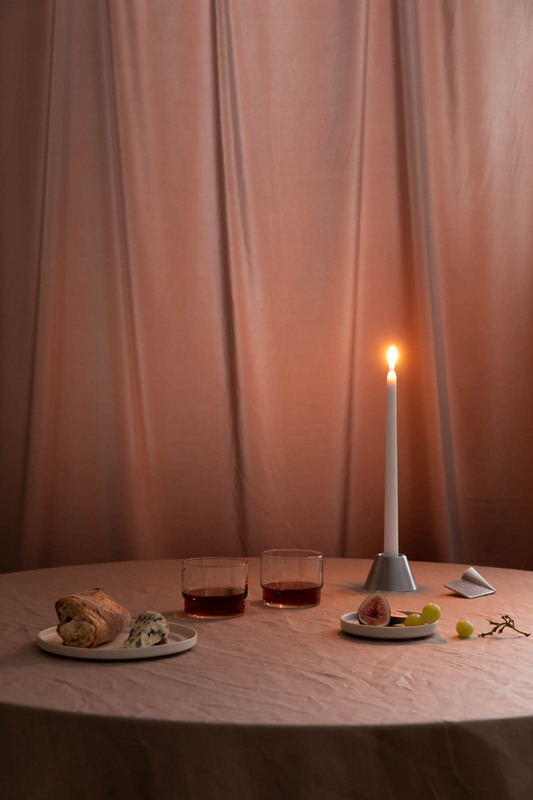 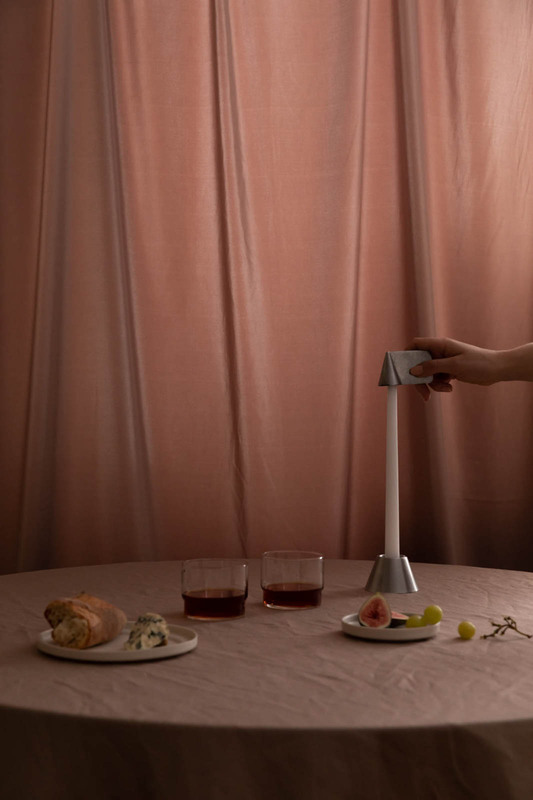 As a candle sits within the Twin Candle Holder, and the Twin Candle Snuffer closes over the burning wick, so too these objects nest with each other to create many combined forms, both while in use and while stored away. 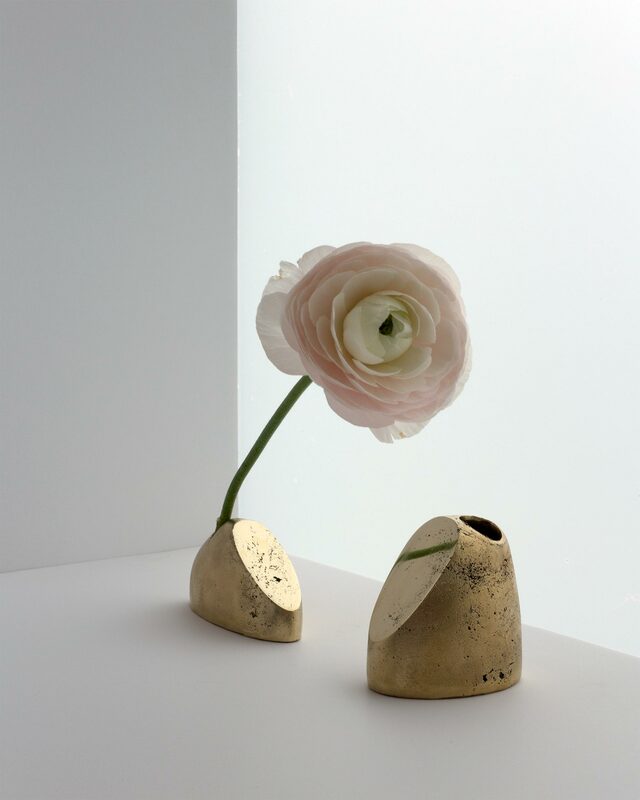 Twin Candle Set is formed in raw, sand-cast aluminum. 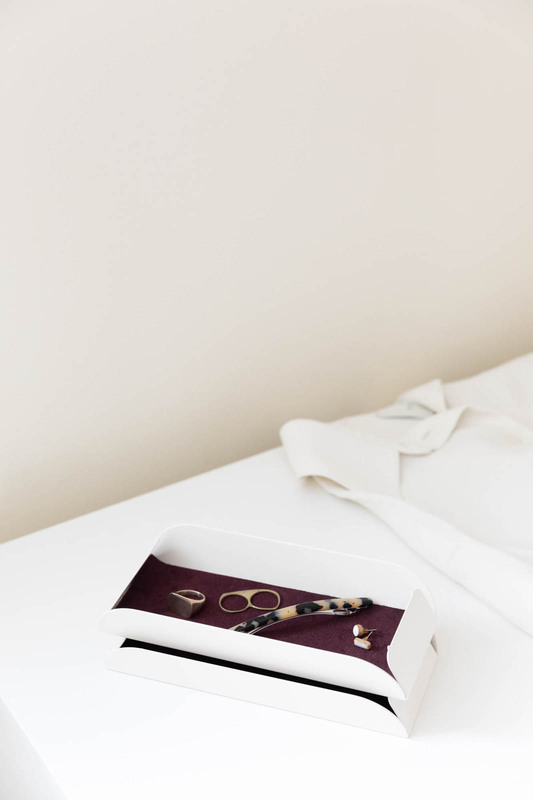 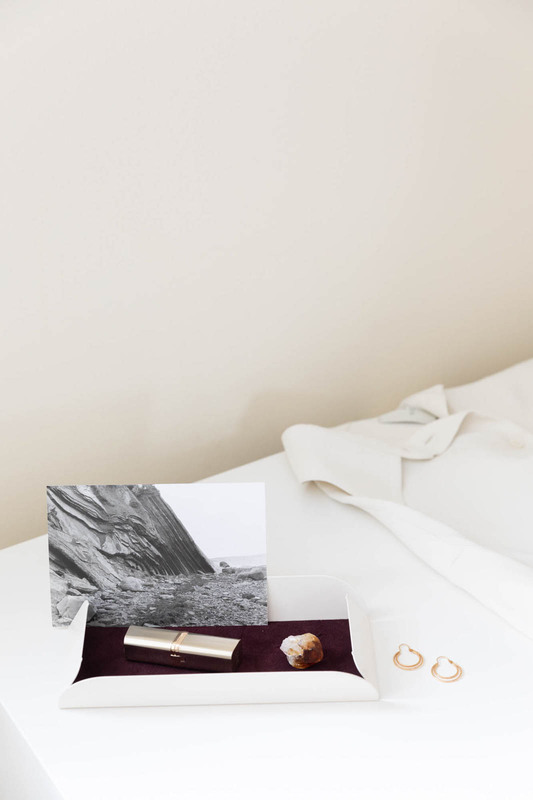 Made from powder coated steel with optional suede inserts, Strata Tray provides storage and display for desktop objects, stationary, and beyond. 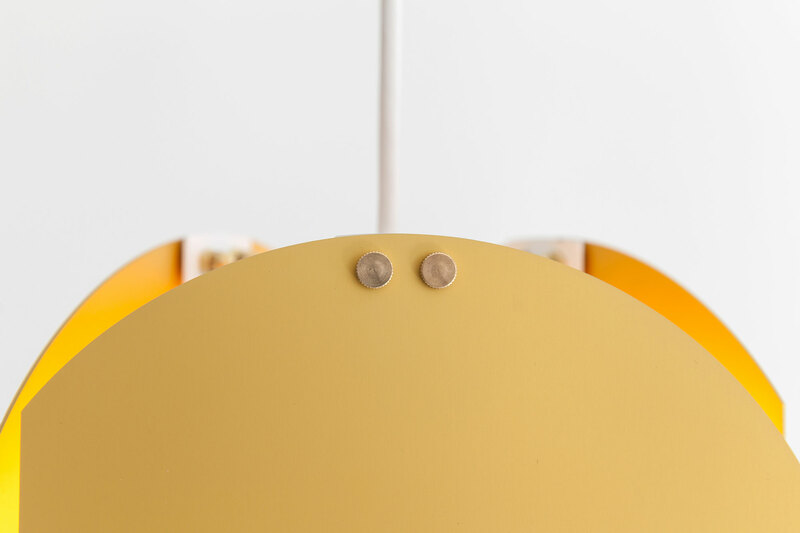 Small notches at the top of the trays align with holes in the bottom, allowing the trays to neatly stack on top of each other. 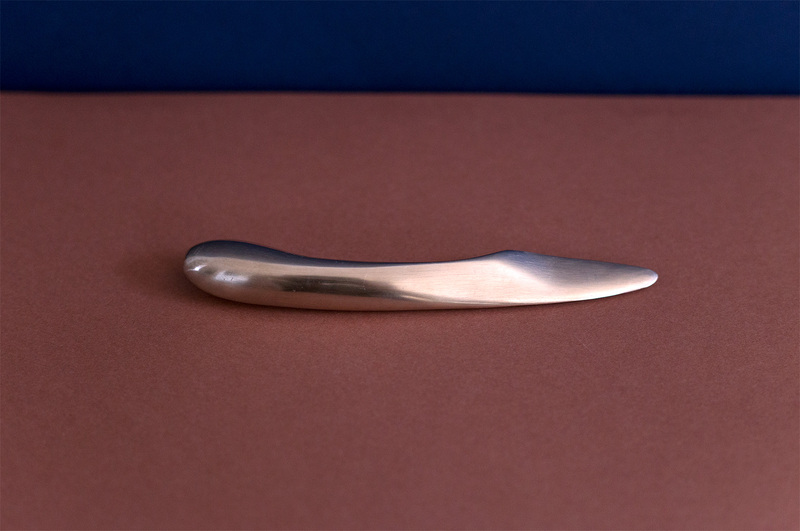 Letter Opener is the result of many processes. 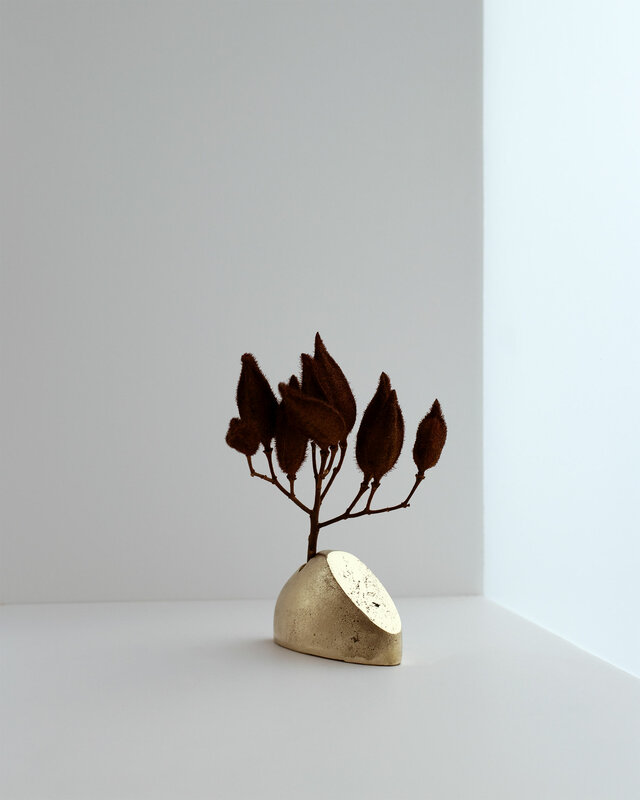 A solid piece of wood was carved, then sand-cast in bronze. 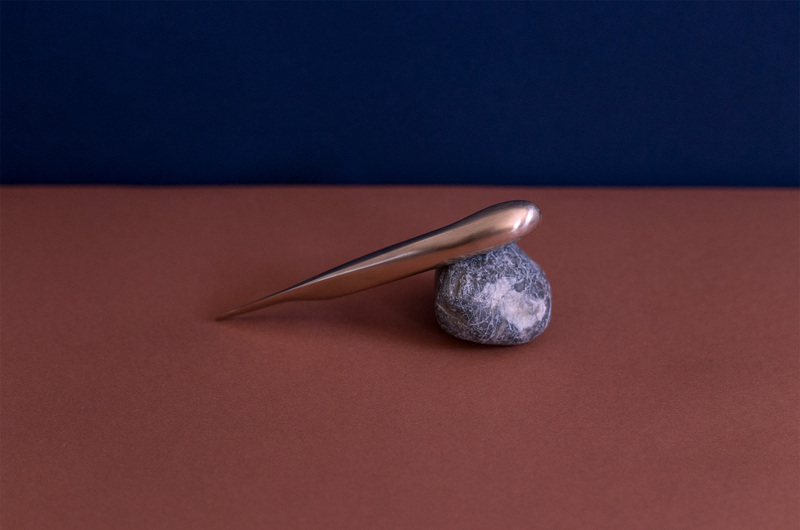 This bronze part was then carved further to arrive at a final form, creating a master copy used for sand-cast, hand-polished Letter Openers. 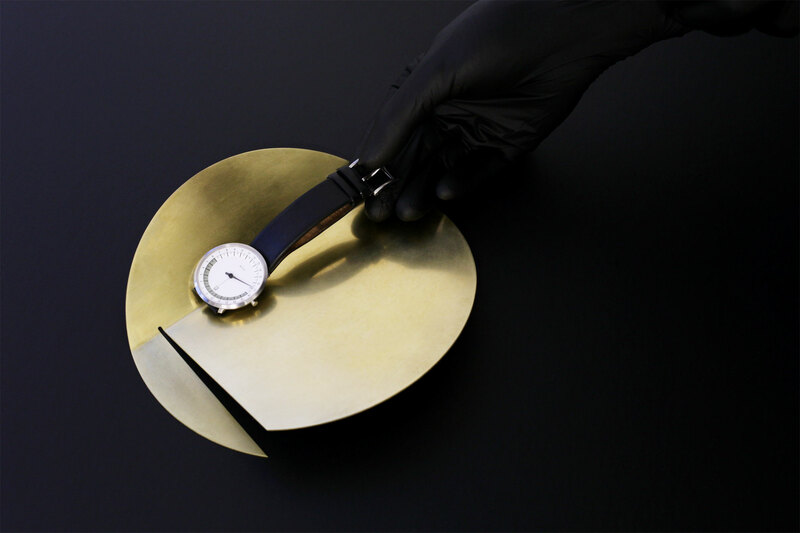 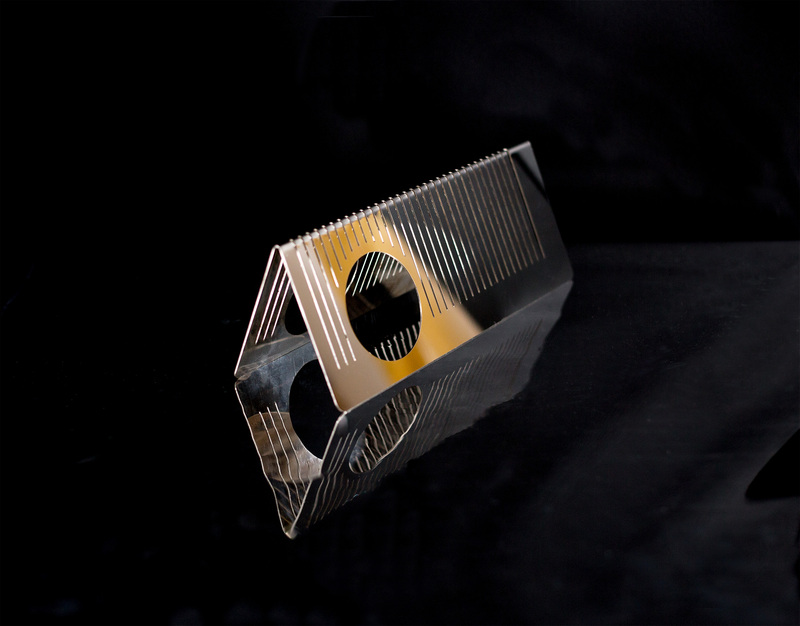 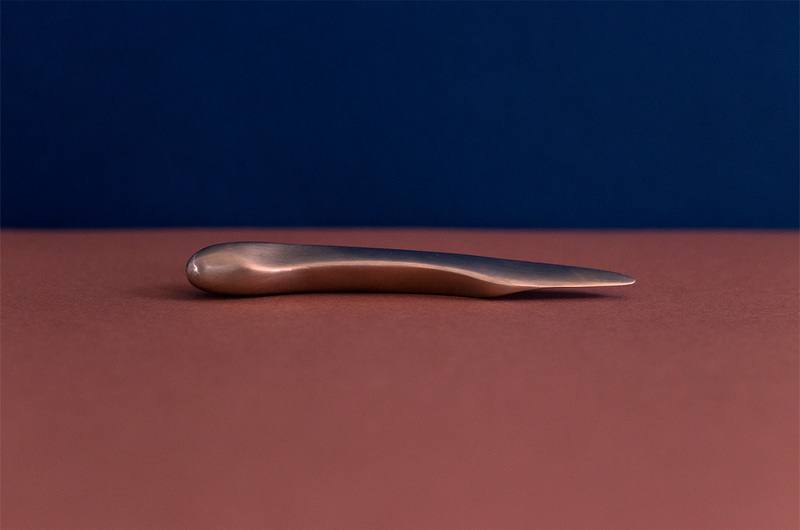 This process has resulted in an undulating form with satisfying weight that is an excellent fit for the hand, marking a distinction from the typically thin letter opener. 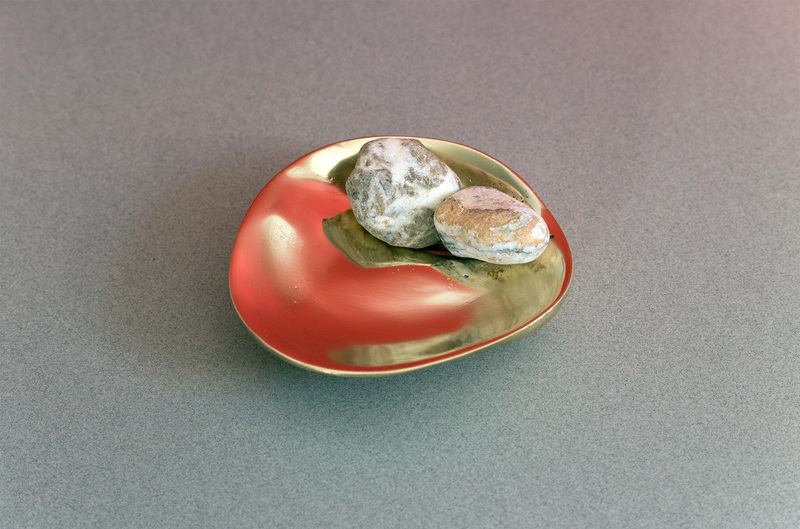 Vide Poche N°03 is the third in an ongoing series of vide-poches. 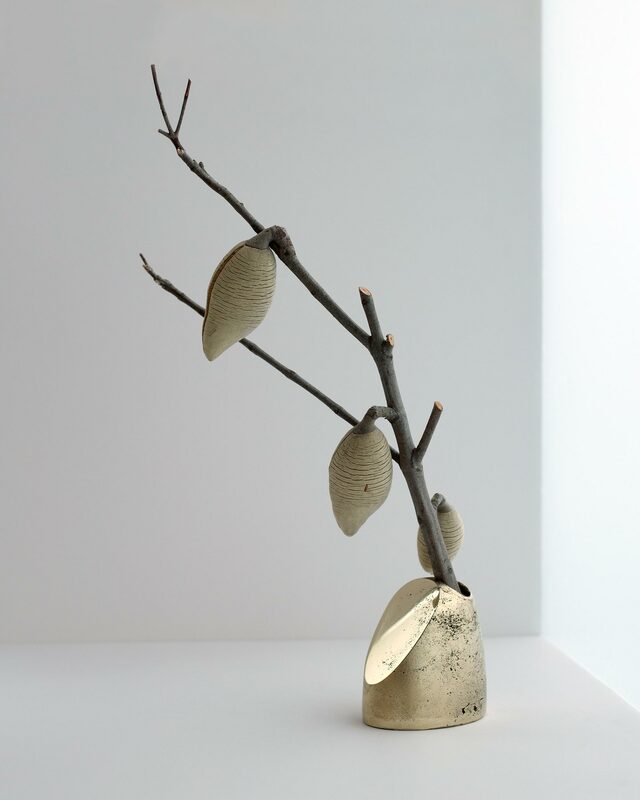 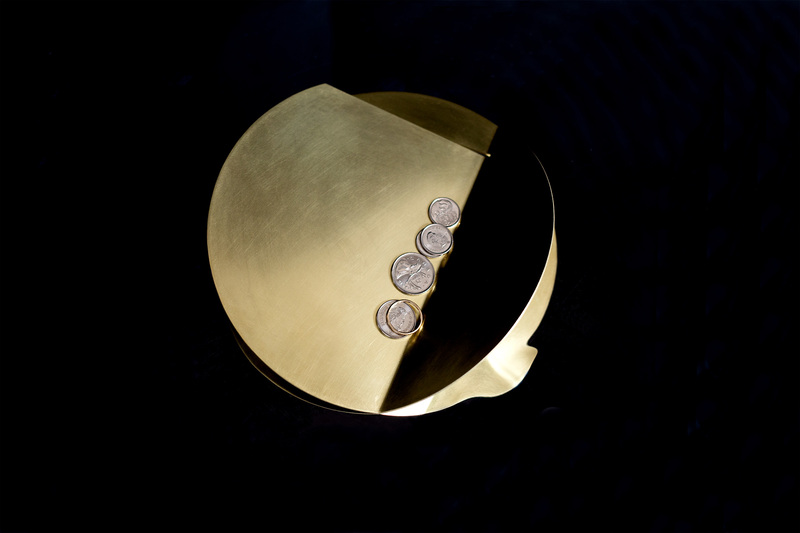 Each is hand-carved and sand-cast in bronze in an edition of three pieces. 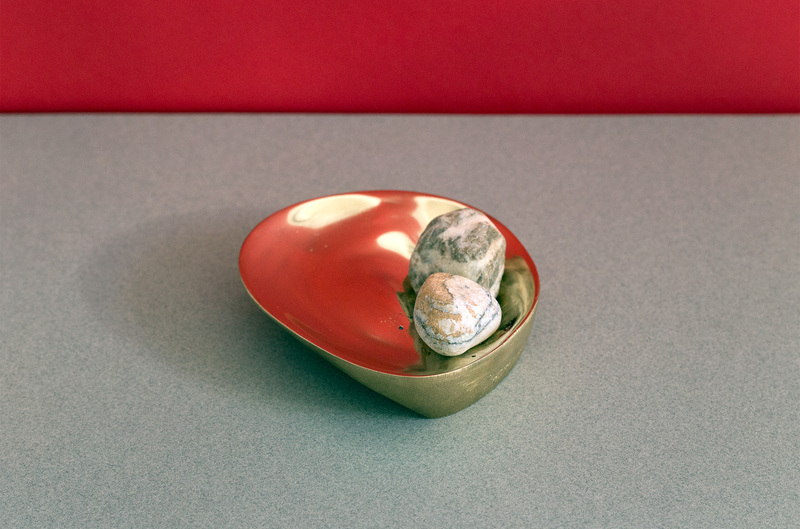 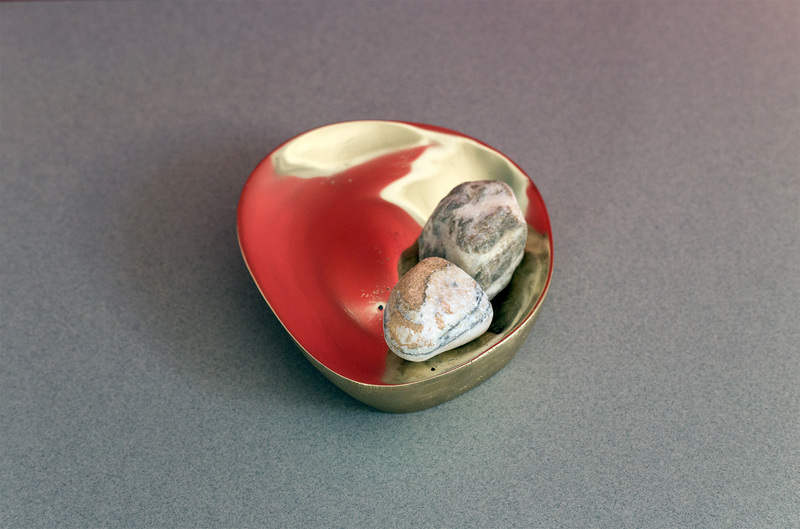 The interior of the vide-poche is then hand-polished, creating a reflective surface and a striking contrast in texture from the rough, sand-cast exterior. 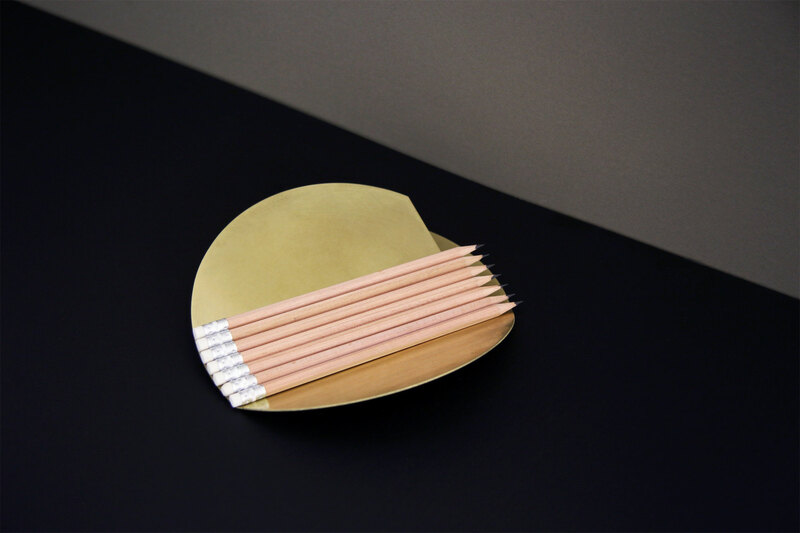 Letter Organizer was created for the exhibtion YOUTH, at Souvenir Studios in Toronto. 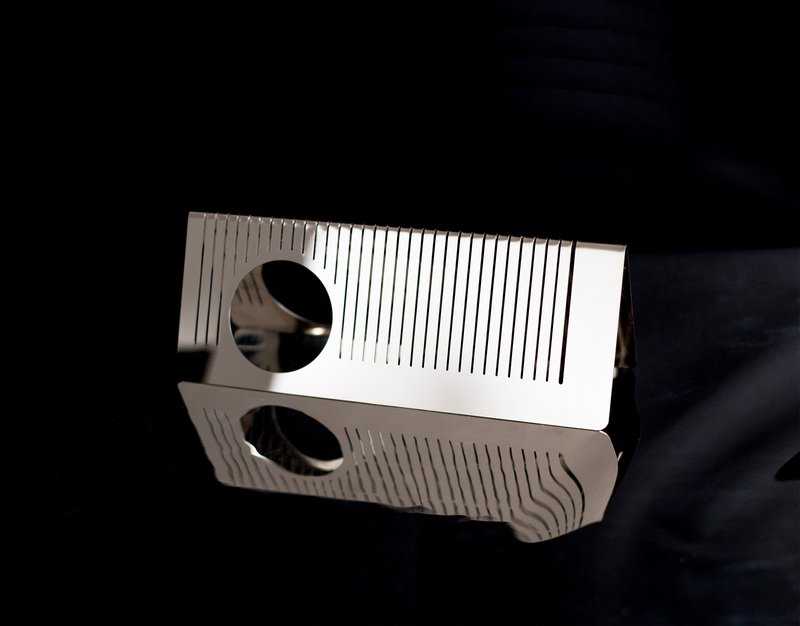 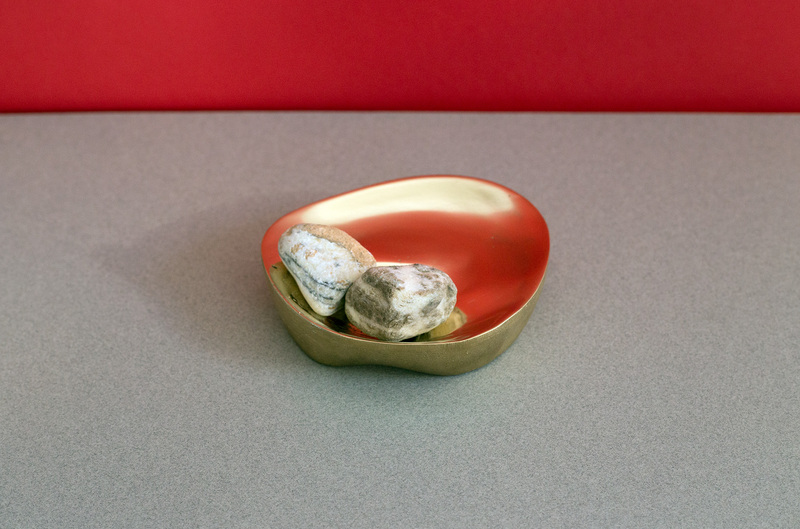 This object was inspired by a desktop organizer at my father's former office. 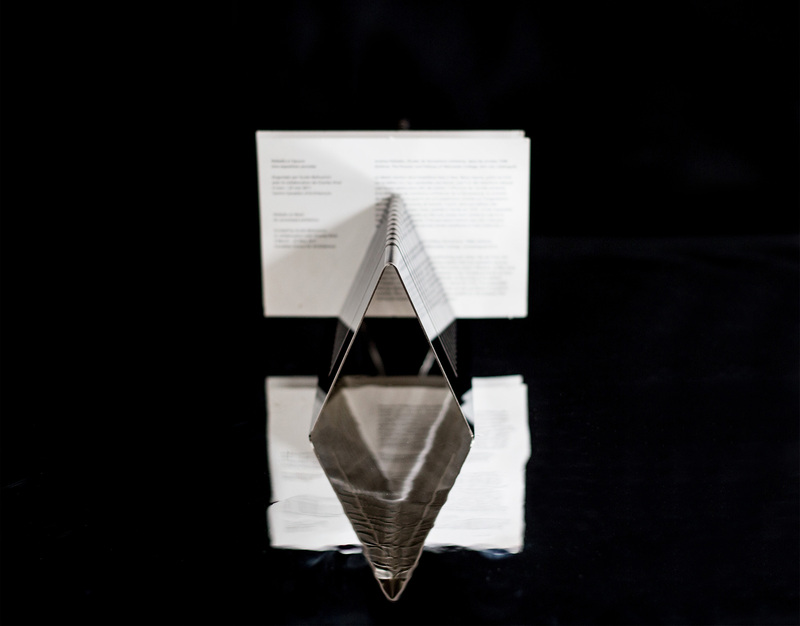 The form of Letter Organizer comes from an 8.5" x 11" ruled piece of paper, folded in half, with the lines replaced by cuts. 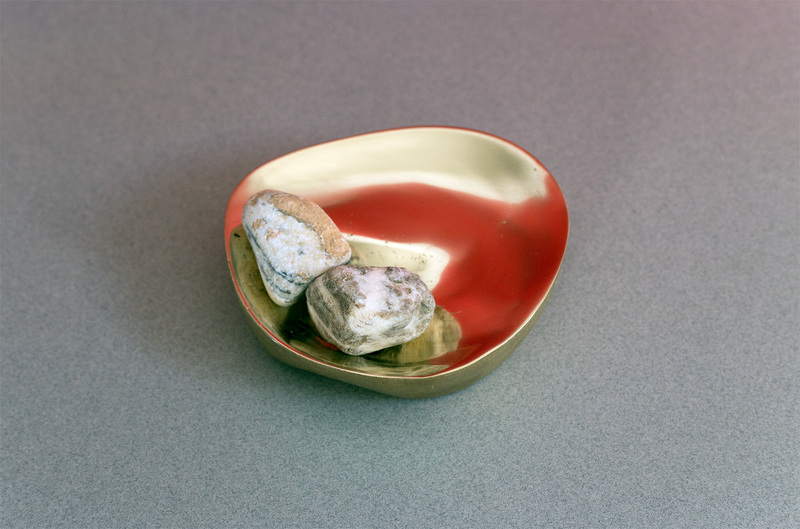 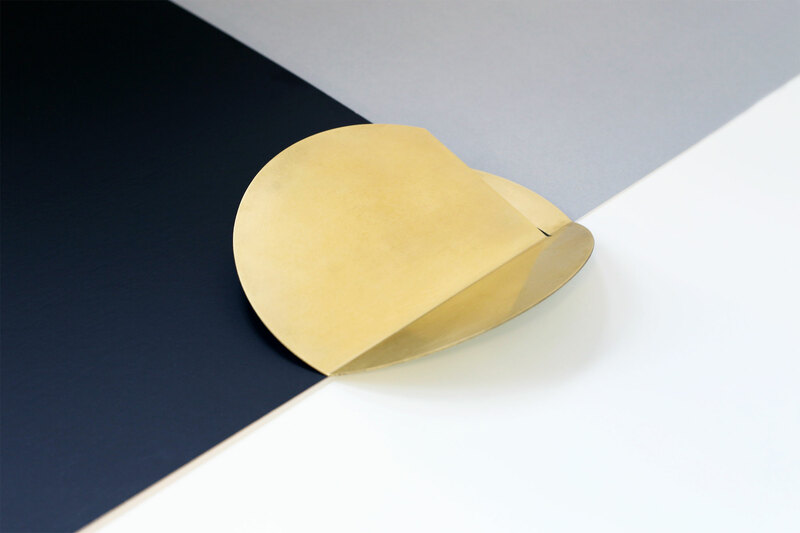 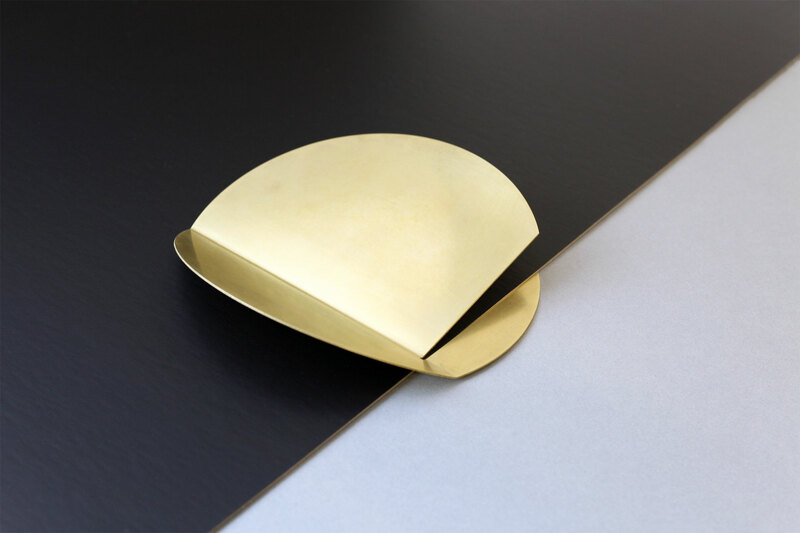 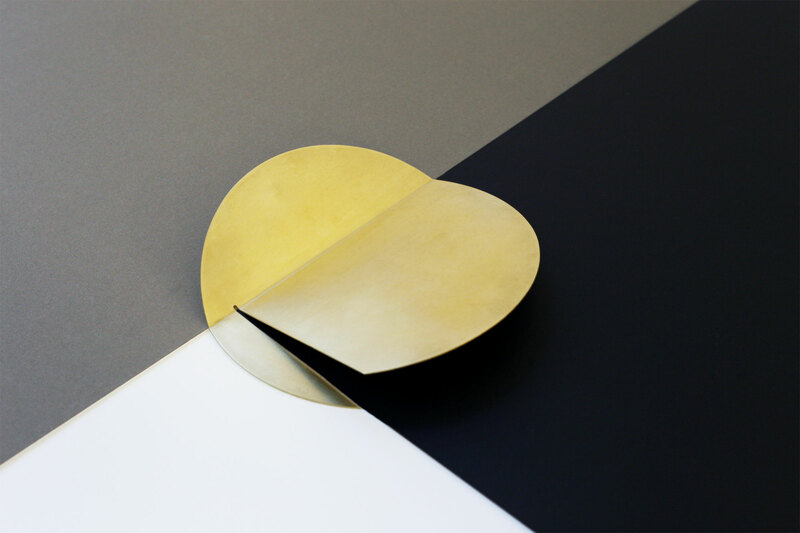 Prop Dish divides and folds a circular sheet of brass to create a V-shape dish, like the open palm of a hand. 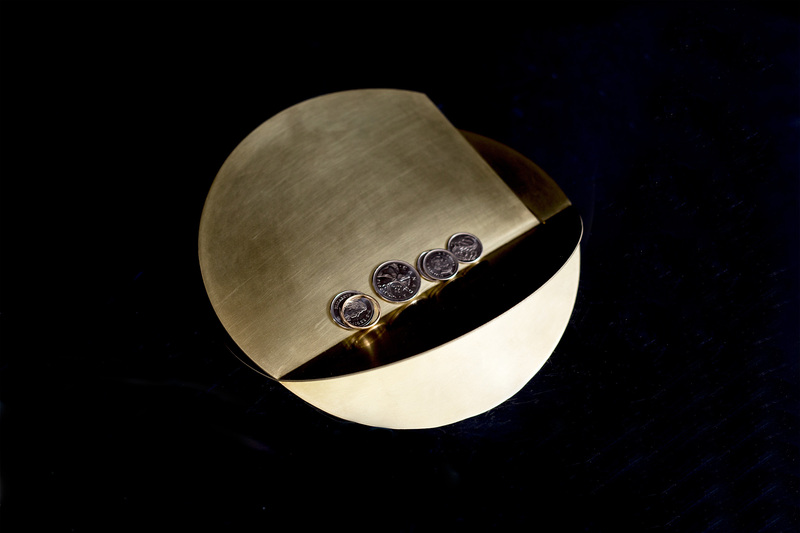 A slender brass foot holds the dish upright, creating a container for keys, coins, watches, and other items of daily use. 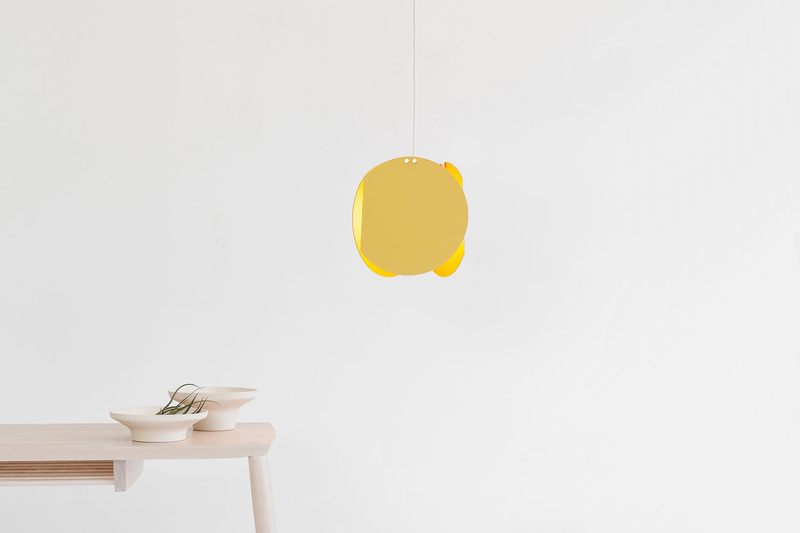 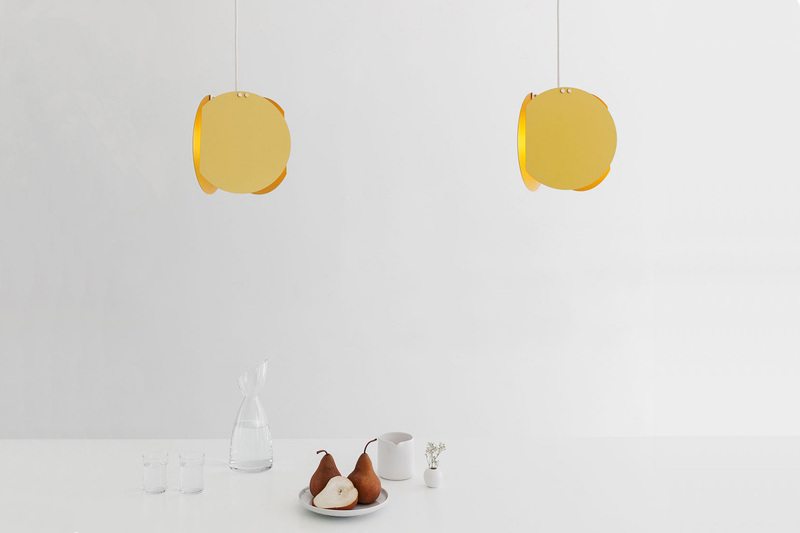 Cut Pendant takes the circular silhouette of a classic globe pendant and repeats it three times to create a unique enclosed shade. 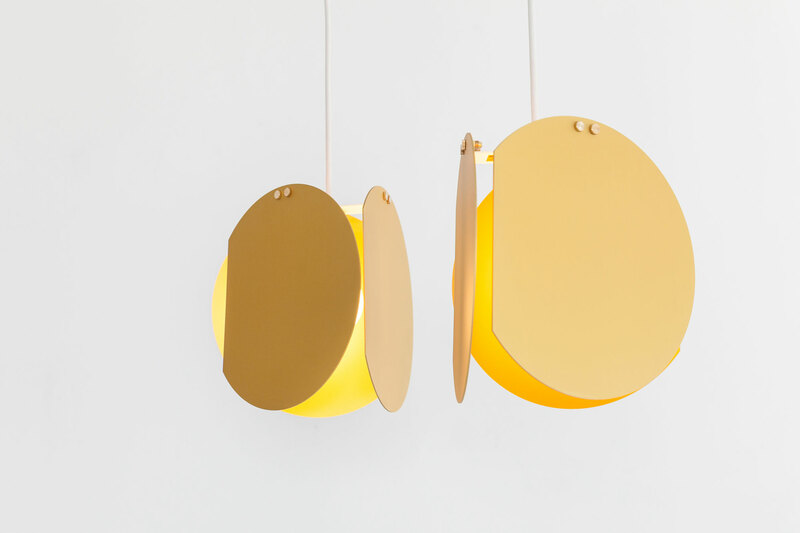 Hanging from a central triangular part, the three truncated discs provide intimate downlight, with ambient light cutting through the gaps between discs. 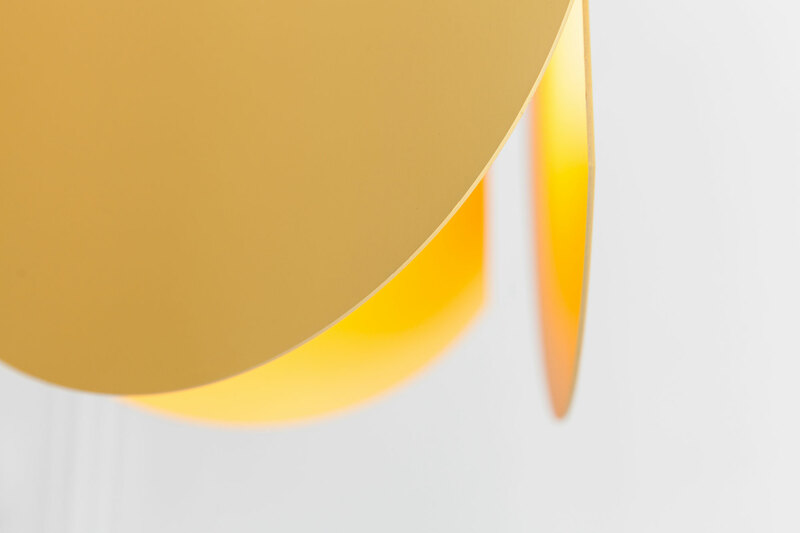 Anodized aluminum is the standard finish for the Cut Pendant but custom materials and finishes are available upon request. 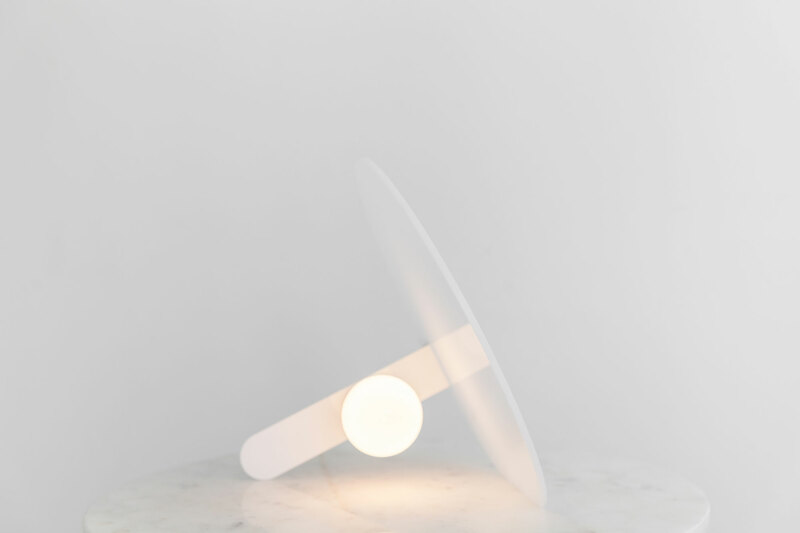 Span Lamp uses crisp geometry to create a uniquely balanced lamp with compelling asymmetric form. 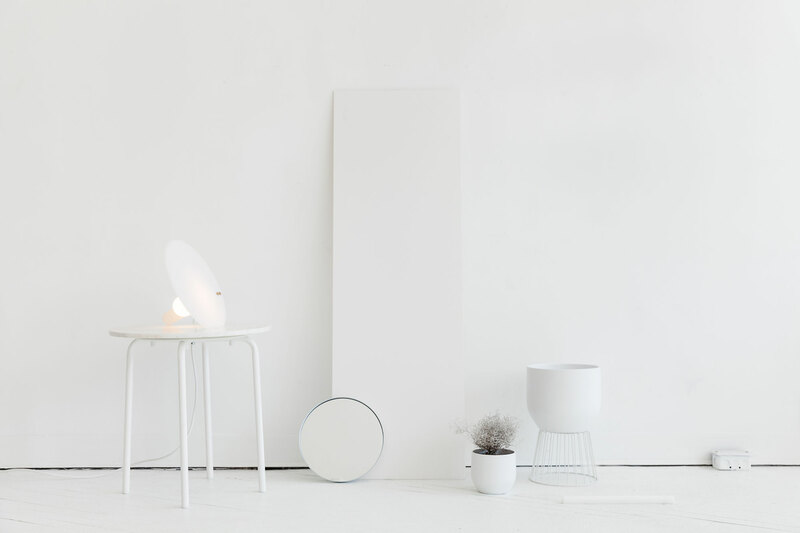 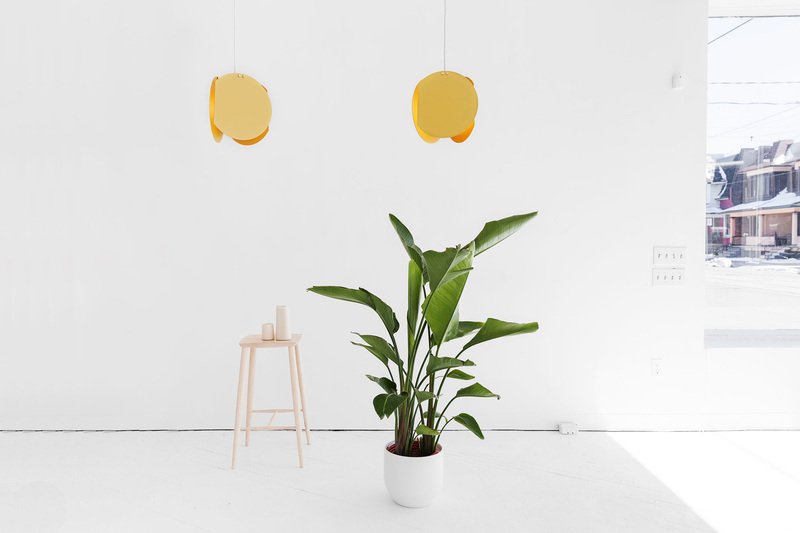 The lamp can be configured in a variety of ways, shifting between direct, reflected, and diffused light. 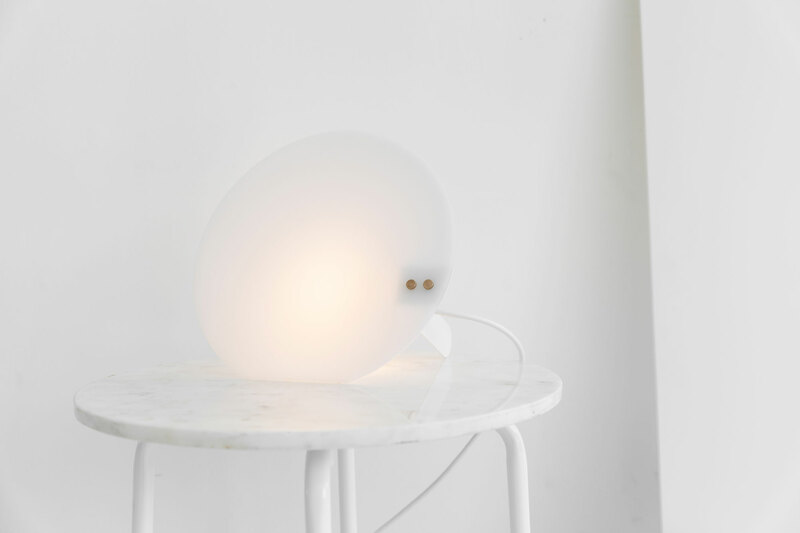 Rich materials and finishes complement this lamp, adding nuance and atmosphere to its solid form. 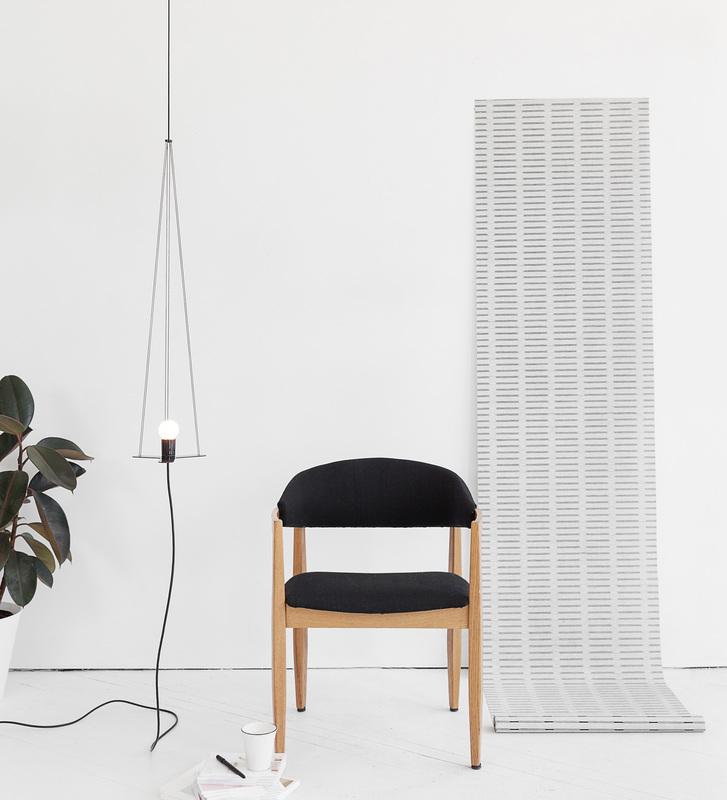 Trace Lamp extends from floor to ceiling, using gravity to pull the lamp's thin lines into an open pyramid. 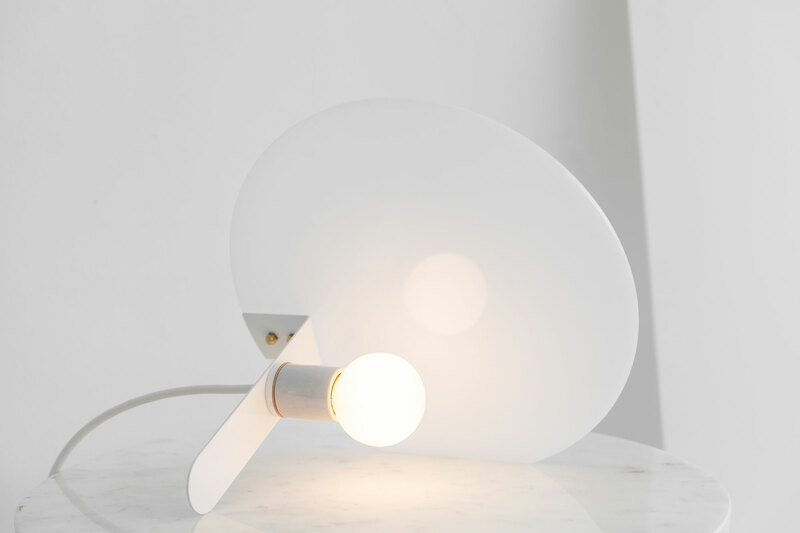 A powder-coated steel base supports the socket and bulb, while a small acrylic disc gathers the converging cords into a single line that extends to the ceiling. 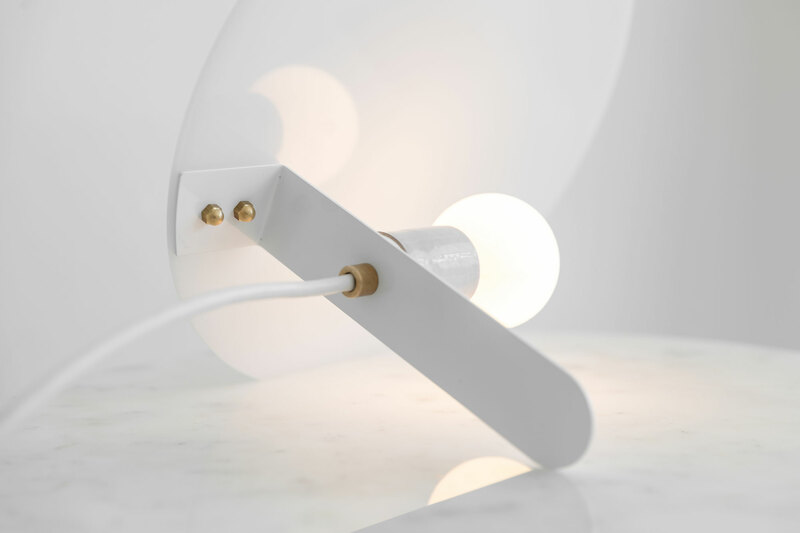 Trace lamp is installed with one screw and works well both as a single lamp and in clusters.